Man’s best friend has the capabilities to do more than just sit, stay and fetch your slippers. Dogs are known for their keen sense of smell and their ability to hear sounds beyond the audio range of humans. Because of these talents, law enforcement agencies, the military and other security companies utilize these amazing creatures in a variety of ways to ensure the safety of the public. As an elite member of a bomb dog squad, they are highly trained and work hard to save lives and prevent deaths. Because of their attention to detail and sensitivity to smells, the canine crime fighters receive praise for being both effective and precise in their efforts. The training programs for bomb sniffers focus on breeds who are hardworking, friendly and enthusiastic to the learning process. Golden retrievers, Labradors and German Shepherds are prime candidates because they possess traits that are unique to the program. The schools typically own and breed the dogs from the puppy stage of life. Although the pups are allowed to stay with their mothers, it’s also important for their early development to have human interaction. Pups are allowed plenty of exercise by focusing their activities on romping through tight spaces and a playground with a series of obstacles and services. This environment introduces them to the challenges that they will face in serious real life situations. This may sound unusual but as they mature to adults, the teachers will focus on developing endurance by having them run on a treadmill. This prepares the animals for hours of long work. In order to achieve the best results, trainers must expose them to various materials both explosive and non-explosive. Non-explosive materials such as hexachlorophene are typically used in order to introduce the dogs to the smell of bombs. Food is another integral part of the training program, and the hound is rewarded with a small treat when they are able to detect a bomb. This gives them the incentive to proceed and search for the explosives. Because Labradors are voracious eaters, trainers find them to be the preferred choice for the Bureau of Alcohol, Tobacco, Firearms and Explosives (ATF) as they respond extremely well to training that is food based. However, the dogs are not fed out of bowls and strictly hand fed several times a day by their handlers during the course of the training program. Unfortunately some of the dogs may not meet the crucial criteria that are expected of them. The dogs who do not meet the level of standards expected of their bomb sniffing purposes are put up for adoption and placed in loving and caring homes. Upon completion of successful training program, most of the dogs will be chosen to work various jobs in the military, law enforcement agencies or other security programs across the country. Both the AFT and Transportation Security Administration implement bomb sniffing dog training programs. 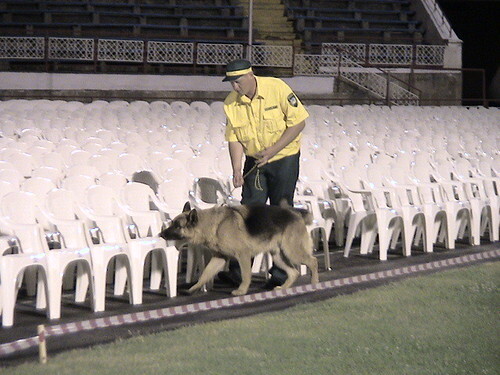 Private security companies also incorporate bomb sniffing dogs into their lineup. 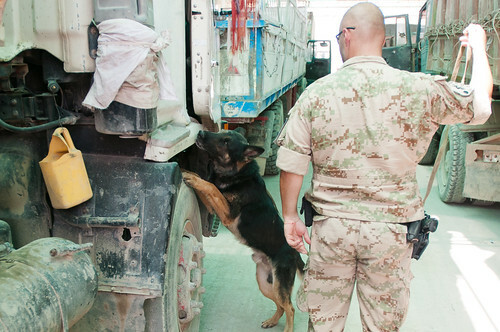 One such company, MSA Security, found online at http://investing.businessweek.com/research/stocks/private/snapshot.asp?privcapId=22249789 uses bomb dogs to provide screening services for chemical, radiological and improvised explosives. As many security companies and law enforcement officials know, the life of a dog can go beyond fetching. Teresa Stewart writes to extol the virtues of bomb sniffing dogs for those interested in their protective services.